I feel so deprived. Why don’t we have Dairy Barns where I live??? We have Brew Thrus for beer lovers. Since I maybe drink 3 beers a year vs. gallons and pounds of dairy, the Dairy Barn would be ever so more helpful to me. Alas. Now Brew Thrus are something I am sure my kids would like! Where do they have those. I love this, but admit I’m a teensy bit let down that there’s no photo of The Eggnog Woman. You went out in slippers & PJ’s? Nice! I thought about it, Wen. But that was too ballsy and rude even for me. After all, she is an icon, I did not want to offend. I love this !! Great picture too! I want a Dairy Barn !! 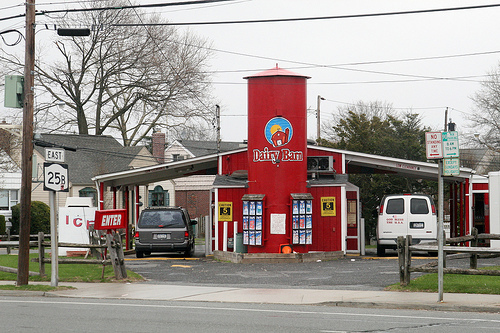 We have Dairy Queens ,but not Dairy Barns. I like Dairy Queen too. That was another childhood memory. Haven’t seen them around here much anymore. I should have given photo credit for the Dairy Barn shot as it was not mine. I was still in pajamas and slippers when I wrote this and didn’t want to go out and get a picture. And truth be told, that is not even our actual Dairy Barn. But you get the gist. I remember the big glass bottles with the red plastic handles…they still have them? Wish they had them in CT…along with sidewalks and street lights!